Bitcoin Core is free and open-source software that serves as a bitcoin node (the set of which form the bitcoin network) and provides a bitcoin wallet which fully verifies payments. It is considered to be bitcoin's reference implementation and is the most used implementation by a large margin. Initially, the software was published by Satoshi Nakamoto under the name "Bitcoin", and later renamed to "Bitcoin Core" to distinguish it from the network. For this reason, it is also known as the Satoshi client. As of 2018[update], Bitcoin Core repositories are maintained by a team of maintainers, with Wladimir J. van der Laan leading the release process. The software validates the entire blockchain, which includes all bitcoin transactions ever. This distributed ledger which has reached more than 235 gigabytes in size as of Jan 2019, must be downloaded or synchronised before full participation of the client may occur. Although the complete blockchain is not needed all at once, since it is possible to run in pruning mode. A command line-based daemon with a JSON-RPC interface, bitcoind, is bundled with Bitcoin Core. It also provides access to testnet, a global testing environment that imitates the bitcoin main network using an alternative blockchain where valueless "test bitcoins" are used. Regtest or Regression Test Mode creates a private blockchain which is used as a local testing environment. Finally, bitcoin-cli, a simple program which allows users to send RPC commands to bitcoind, is also included. In October 2016, Bitcoin Core’s 0.13.1 release featured the "Segwit" soft fork that included a scaling improvement aiming to optimize the bitcoin blocksize. The patch which was originally finalised in April, and 35 developers were engaged to deploy it. This release featured Segregated Witness (SegWit) which aimed to place downward pressure on transaction fees as well as increase the maximum transaction capacity of the network. The 0.13.1 release endured extensive testing and research leading to some delays in its release date. [better source needed] SegWit prevents various forms of transaction malleability. A Bitcoin Improvement Proposal (BIP) is a design document, typically describing a new feature for Bitcoin with a concise technical specification of the feature and the rationale for it. This is broadly similar to the way in which Internet "Request for Comments" (RFCs) and the Python computer language's "Python Enhancement Proposals" (PEPs) are used. BIP 2 specifies the BIP process. BIP numbers are awarded liberally. As of February 2017, 152 BIP numbers have been assigned, but only 27 BIP's have reached the active/final stages. These HD ('Hierarchical Deterministic") wallets can be shared partially or entirely with different systems. To determine the further structure; for example, the scheme described in BIP44 should use the value 44' as the "purpose". based on the algorithm described in BIP32 and "purpose" scheme described in BIP43. CSV enables making an address (starting with 3) which can't spend bitcoin received, for a specified amount of time after receiving. One can have a 2-of-3 multisig address, which times out to a backup rule, unless there is 2-of-3 consensus. ^ Antonopoulos, Andreas. "3". Mastering Bitcoin: Programming the Open Blockchain (2nd ed.). O'Reilly Media. ISBN 978-1491954386. Bitcoin Core is the reference implementation of the bitcoin system, meaning that it is the authoritative reference on how each part of the technology should be implemented. Bitcoin Core implements all aspects of bitcoin, including wallets, a transaction and block validation engine, and a full network node in the peer-to-peer bitcoin network. ^ "Global Bitcoin nodes distribution". bitnodes.earn.com. Retrieved 9 September 2018. ^ "Bitcoin Core version 0.9.0 released". Bitcoin Core. 19 Mar 2014. Retrieved 21 October 2018. ^ a b c Antonopoulos, Andreas M. (2014). Mastering Bitcoin: Unlocking Digital Cryptocurrencies. O'Reilly Media, Inc. pp. 31–32. ISBN 1491902647. Retrieved 6 November 2016. ^ "0.13.0 Binary Safety Warning". Bitcoin Core. Bitcoin Project. 17 August 2016. Retrieved 21 Oct 2018. ^ "MIT Announces $900,000 Bitcoin Developer Fund". Inc. 29 Mar 2016. Retrieved 21 October 2018. ^ a b "About". Bitcoin Core. Retrieved 21 October 2018. ^ "Bitcoin Developer Examples". Bitcoin. Retrieved 21 Oct 2018. ^ "checkpoints.cpp". Repository source code. GitHub, Inc. Retrieved 13 November 2016. ^ "bitcoin/chainparams.cpp". GitHub. Retrieved 21 October 2018. ^ "Alert System Retirement". Bitcoin Project. 1 November 2016. Retrieved 16 November 2016. ^ Antonopoulos, Andreas (29 May 2013). "Bitcoin is a money platform with many APIs". Radar. O'Reilly. Retrieved 19 November 2016. ^ "Bitcoin Core devtools README - Create and verify timestamps of merge commits". GitHub. Retrieved May 5, 2018. ^ "Re: Bitcoin P2P e-cash paper". The Cryptography Mailing List. Satoshi Nakamoto Institute. 9 October 2016. Retrieved 13 November 2016. ^ Aaron van Wirdum (7 September 2016). "A Primer on Bitcoin Governance, or Why Developers Aren't in Charge of the Protocol". Bitcoin Magazine. BTC Inc. Retrieved 13 November 2016. ^ Daniel Cawrey (29 December 2014). "Gregory Maxwell: How I Went From Bitcoin Skeptic to Core Developer". CoinDesk. Retrieved 23 December 2016. ^ Bailey Reutzel (14 May 2016). "Bitcoin Core is Seeking to Overhaul How it Upgrades its Code". Coindesk. Retrieved 7 November 2016. ^ a b c d "History of Cryptocurrency, Part I: From Bitcoin's Inception to the Crypto-Boom". The Cointelegraph. April 11, 2015. Retrieved October 21, 2018. ^ "About bitcoin.org". Bitcoin Project. Retrieved 14 November 2016. 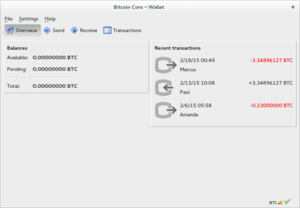 ^ "Bitcoin-Qt version 0.5.0 released". Bitcoin Project. 1 November 2011. Retrieved 13 November 2016. ^ a b Vitalik Buterin (13 March 2013). "Bitcoin Network Shaken by Blockchain Fork". Bitcoin Magazine. BTC Inc. Retrieved 7 November 2016. ^ a b Danny Bradbury (28 February 2014). "Bitcoin Transaction Fees To Be Slashed Tenfold". Coindesk. Retrieved 22 December 2016. ^ Khaosan, Venzen (April 8, 2014). "OpenSSL Heartbleed Security Bug "Massive"". CryptoCoinsNews. Retrieved October 21, 2018. ^ Joon Ian Wong (17 February 2015). "Bitcoin Core 0.10 Gives Developers Simplified Access to Network Consensus". Coindesk. Retrieved 7 November 2016. ^ "Bitcoin Core version 0.11.2 released". Bitcoin Project. 13 November 2015. Retrieved 14 November 2016. ^ Kyle Torpey (15 April 2016). "Bitcoin Core 0.12.1 Released, Major Step Forward for Scalability". Bitcoin Magazine. NASDAQ.com. Retrieved 7 November 2016. ^ Aaron van Wirdum (22 August 2016). "What's New in Bitcoin Core 0.13.0?". Bitcoin Magazine. BTC Inc. Retrieved 7 November 2016. ^ Antonopoulos, Andreas. Mastering Bitcoin: Programming the Open Blockchain (2nd ed.). O'Reilly Media. ISBN 978-1491954386. BIP-68 and BIP-112 were activated in May 2016 as a soft fork upgrade to the consensus rules. ^ Joseph Young (18 October 2016). "Ready, Steady, Fork: Bitcoin Core to Release SegWit in November". Retrieved 7 November 2016. ^ Luke Parker (29 October 2016). "Bitcoin scaling solution, Segwit, released". Brave New Coin. Retrieved 7 November 2016. ^ "Bitcoin Core 0.13.1". Bitcoin Core. Retrieved 25 October 2016. ^ Joseph Young (3 November 2016). "Bitcoin Core is Most Talented Dev Team, Says VC". The Coin Telegraph. Retrieved 7 November 2016. ^ "Segregated Witness Benefits". Bitcoin Core. January 26, 2016. Retrieved October 20, 2018. ^ Hertig, Alyssa (February 20, 2018). "New Bitcoin Code Will Finally Boast Full SegWit Support". CoinDesk. Retrieved October 21, 2018. ^ "CVE-2018-17144 Full Disclosure". Bitcoin Core. Retrieved 2018-09-23. ^ "bip-0123.mediawiki". GitHub. Retrieved 21 October 2018. ^ "assignments.mediawiki". GitHub. Retrieved 21 October 2018. ^ "bip-0032.mediawiki". GitHub. Retrieved 21 October 2018. ^ "bip-0039.mediawiki". GitHub. Retrieved 21 October 2018. ^ a b "bip-0043.mediawiki". GitHub. Retrieved 21 October 2018. ^ "bip-0065.mediawiki". GitHub. Retrieved 21 October 2018. ^ "Compact Blocks FAQ". GitHub. Retrieved 21 October 2018. This page was last edited on 14 February 2019, at 16:02 (UTC).